Full interview: Artist, Franke James To Moms: Keep Speaking Up! 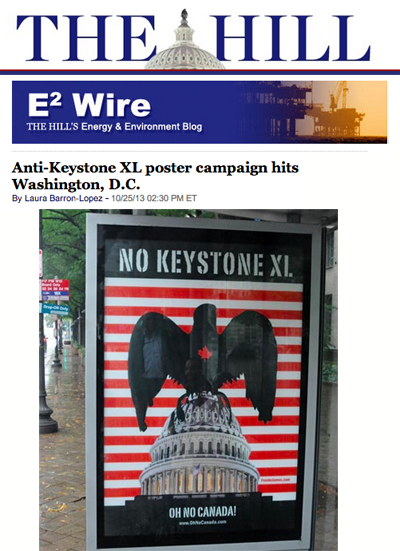 “Through October and most of November, James’ poster art criticizing Harper and the Keystone XL will be displayed at Washington, D.C. bus stops along Pennsylvania and Constitution Avenues near the White House and the Capitol. The five-figure ad-buy was paid for by three U.S. environmental groups—Natural Resources Defense Council, Sierra Club and National Wildlife Federation—as well as through crowd-funding. “Anti-Keystone XL pipeline posters blasting Canada’s oil sands and carbon pollution have cropped up on the streets of Washington, D.C.
“The posters are a part of a two-month ad campaign by Canadian environmentalist Franke James. “Another poster reads, “Do not talk about climate change — it is against Canada’s policy,” with an image of Canada’s parliament buildings dropped into the tar sands. Full Story: Anti-Keystone XL poster campaign hits Washington, D.C.
“Anti-oilsands posters calling Canada a “dirty old man” have hit the streets of Washington, D.C., the latest salvo in an ongoing public relations war over the oilsands. 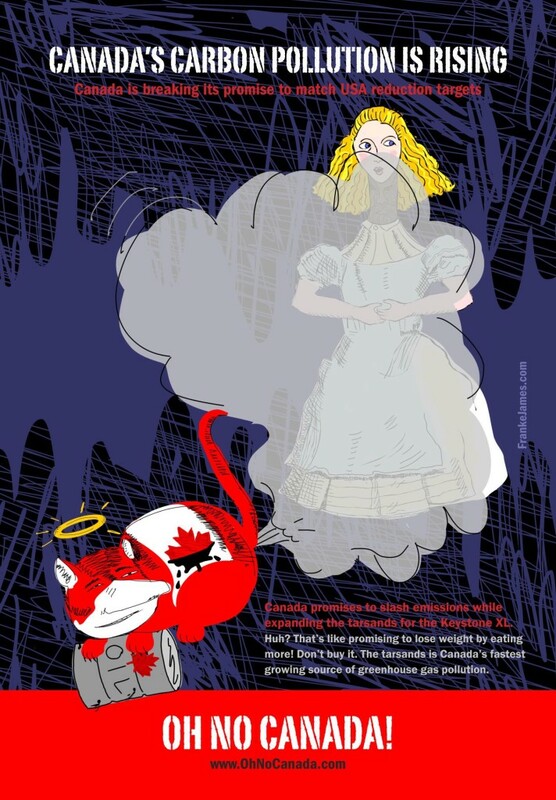 Another poster features a quote, “Canada is the dirty old man,”… citing an article from The Guardian arguing Canada has a poor environmental track record. 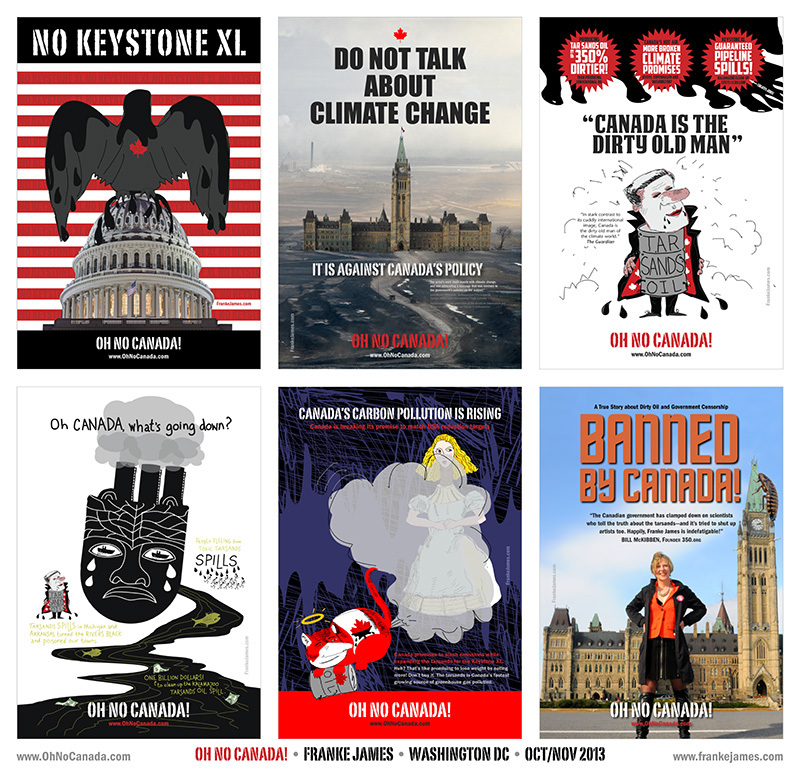 The posters — which have also appeared in Ottawa and Halifax — are the work of Canadian artist Franke James, who published a book earlier this year alleging that the federal government cut her funding for a European tour because of her anti-oilsands opinions. “For Prime Minister Stephen Harper, it’s probably a pin-prick compared with the thermonuclear bombshell Sen. Mike Duffy dropped in the Senate expenses scandal, but a Toronto artist is also exacting revenge against the government she believes wronged her. “Franke James has launched a poster campaign labelling Canada a “dirty old man,” and depicting Harper as a flasher after Ottawa cancelled funding for a planned tour of her artwork in Europe, according to the Huffington Post. 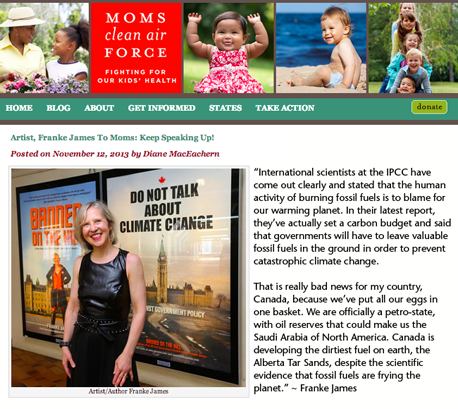 James claims the 20-city tour was quashed because she’s spoken out against oil sands development. “The posters have shown up in Ottawa, Halifax and, perhaps most significantly, Washington, D.C., where the U.S. government where a debate is raging on whether to approve the Keystone XL pipeline that would ship Alberta oil sands crude to Gulf Coast refineries. “The artist’s work dealt mostly with climate change, and was advocating a message that was contrary to the government’s policies on the subject,” the email said, according to the Star. “Her first counterblow was a book about her experience: Banned on the Hill: A True Story about Dirty Oil and Government Censorship. The book included information James obtained under access-to-information legislation, such as that email. “The poster above is just one of a series that has been mysteriously appearing in Washington DC. 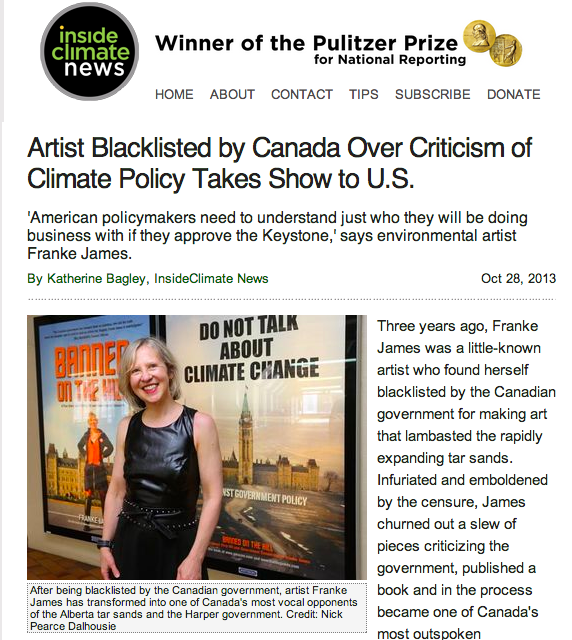 They’re the work of Franke James, a Canadian activist author and artist. 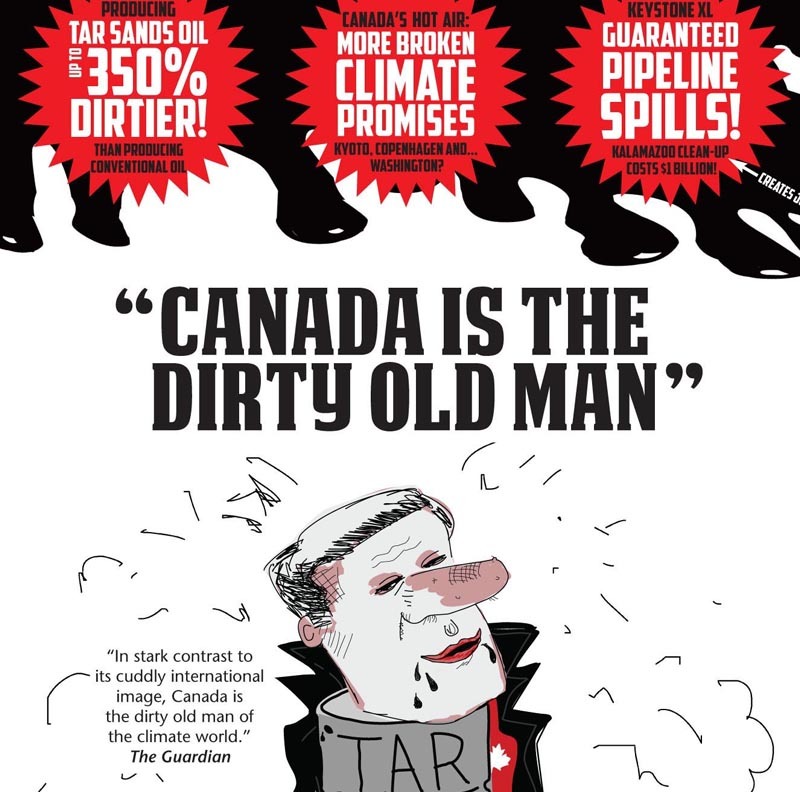 She calls it an “anti-tarsands art show,” and it features some pretty harsh imagery, including a cartoon of Canada’s Prime Minister as a flasher. Ms. James has bought transit shelter ad space, and her posters will run through November at 7th & Pennsylvania NW, 10th & Pennsylvania NW, 8th & Pennsylvania SE, 7th & Constitution NW, and 15th & Constitution NW. “A new poster campaign has launched in Washington, D.C. to discredit Canadian oil, as the promised Keystone XL pipeline to American markets nears approval. The latest poster shows an image of Stephen Harper wearing an oil barrel and a long jacket. 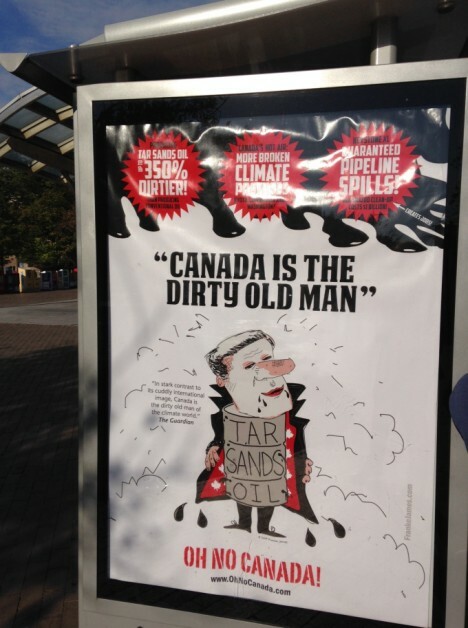 “Canada is the dirty old man,” the text above Harper reads. “The poster series is the work of Franke James, a Canadian author and activist. Three of the six posters have already appeared on bus shelters across Washington. The three remaining will roll out across the city before the end of October. WASHINGTON — Five prominent Canadian environmentalists told Washington lawmakers this week that the Keystone XL pipeline will lead to such a huge growth in oilsands’ carbon emissions, it will help tip the world into catastrophic climate change. 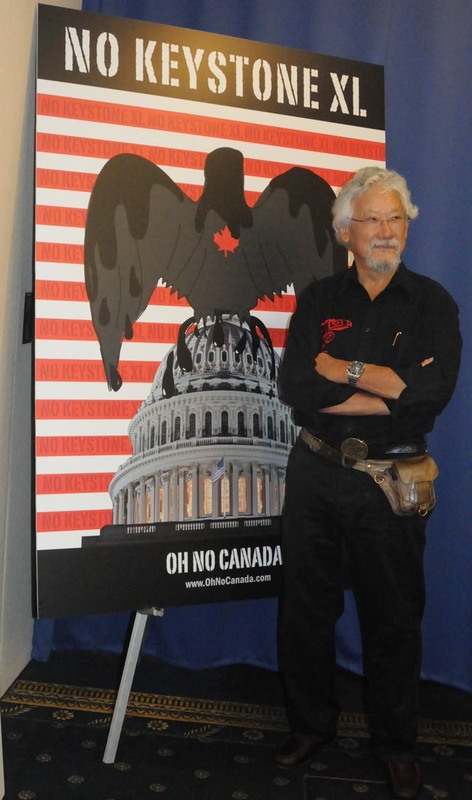 Full Story: David Suzuki slams Harper science policy in Washington speech by Paul Koring. Environmental activist David Suzuki was among a group of Canadians in Washington, D.C., today to urge U.S. President Barack Obama’s administration to reject the Keystone XL pipeline, telling Americans that Canadian Prime Minister Stephen Harper can’t be trusted when it comes to climate change promises. In an interview after the talk, Suzuki said the government’s claim that Canada is leading the world in fighting climate change can’t be taken seriously, based on how it has undervalued the importance of science. He said Americans should know what’s going on in Canada, particularly because of the steady stream of Harper cabinet members who visit Washington and advocate for the pipeline to be approved. Full Story: David Suzuki tells U.S. not to trust Harper’s Keystone XL promises by Meagan Fitzpatrick. Minister Stephen Harper digs his heels in by saying he “won’t take no” for an answer on the Keystone XL pipeline. Full Story: Canadian Scientists Expose Their Government’s Tar Sands Obsession at DC Briefing. The Canadian activists described their trip as an attempt to counter the message frequently delivered in Washington by the governments of Canada and Alberta, which have emphasized the fact that Canada has committed to the same greenhouse gas emissions targets as the United States: a 17 per cent reduction by the year 2020. They said the pipeline was a critical enabler over future expansion of the oil sands, and therefore incompatible with those goals. The activists’ trip came just as the Canadian government prepares a 2-year $24-million international advertising campaign aimed at shoring up the image of the oil sands in the United States and elsewhere. 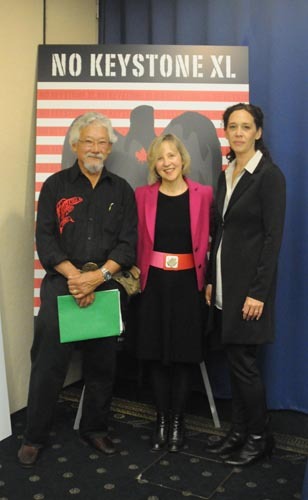 Full Story: Suzuki to Obama admin: Don’t trust Harper, he’s like Bush by Luiza Ch. Savage. 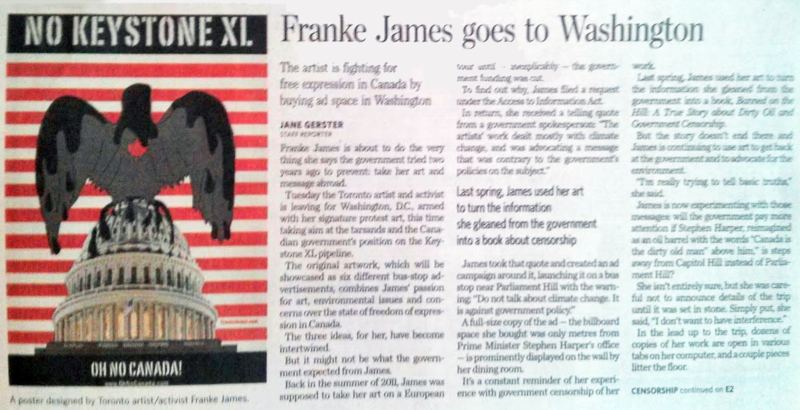 Franke James is about to do the very thing she says the government tried two years ago to prevent: take her art and message abroad. Tuesday the Toronto artist and activist is leaving for Washington, D.C., armed with her signature protest art, this time taking aim at the Tar Sands and the Canadian government’s position on the Keystone XL pipeline. The original artwork, which will be showcased as six different bus-stop advertisements, combines James’ passion for art, environmental issues and concerns over the state of freedom of expression in Canada. But now, Washingtonians will get a taste of James’ special brand of speaking up. The ads will be displayed in the city until the end of November; one is already in place, two more by next week.